The backyard battles he couldn’t win; the biased crowds he couldn’t convert; the hamstring he strained when he should have been collecting scholarship offers and the shin he rehabbed when he should have been conducting draft workouts; the winters in Santa Cruz, Calif., and Erie, Pa., that wouldn’t end, the calls from Europe and Asia that wouldn’t stop, the 10-day contracts in Cleveland and Phoenix that weren’t renewed; the night he played his first NBA game with the Grizzlies—and was waived on the bus an hour later; the night he hit his first NBA basket over James Harden—still his only bucket. Steph’s story is a fairy tale. Seth’s is the reality play of an undersized and underrecruited combo guard, with excellent genes and awful luck. He put up more points in a season than anybody in the history of Charlotte Christian High—including the 2015 NBA MVP. He was the top-scoring freshman in the nation at Liberty. He transferred to Duke, where he averaged 17.5 points as a senior, despite wearing a walking boot at every practice because of a stress fracture in his right shin. “He’s going to be as good or better than I am,” Steph predicted in ’08. But 6’2″, 185-pound snipers are never a sure thing, regardless of the name on the back of their jersey. Seth went undrafted in ’13. You might have seen him in this year’s NBA playoffs, convulsing in the lower bowl at Smoothie King Center in New Orleans as Steph made the game-tying corner three while getting pummeled by two Pelicans; or at the MVP ceremony, pretending not to cry as Steph hailed his perseverance; or after the Warriors wrapped up the championship, rushing down to the court as Steph gave out hugs. What you didn’t see were the late-night workouts at Golden State’s practice facility, the early morning drills at Beverly Hills High, the trip to Cleveland during the Finals when he stole away to practice at a high school gym. “I’m so happy for Steph and what he’s accomplished,” says Seth, 25. “But you want it for yourself too.” He incinerated the Las Vegas Summer League, as Steph watched nervously on NBATV, tuning in from the delivery room the day his second daughter, Ryan, was born. “Wife gave the approval,” Steph clarifies. He learned his hoops by watching Dell and battling Steph. When Dell overhauled Steph’s shot one summer in Charlotte, Seth silently adjusted his own, so he wouldn’t have to endure the whole painful process later. When the family moved to Toronto and Dell played for the Raptors, Seth spent the first half of games in the stands at Air Canada Centre, and the second half mimicking what he’d just seen as he dueled Steph on the practice court in the arena. Because Seth was 2½ years younger, he relied on gimmicks to compete in the seven-game series they staged, quitting if he took an early lead or threatening to quit over iffy foul calls. But as he grew, and matchups shifted to the full court behind their Charlotte home, he didn’t need the stunts. He won his share. 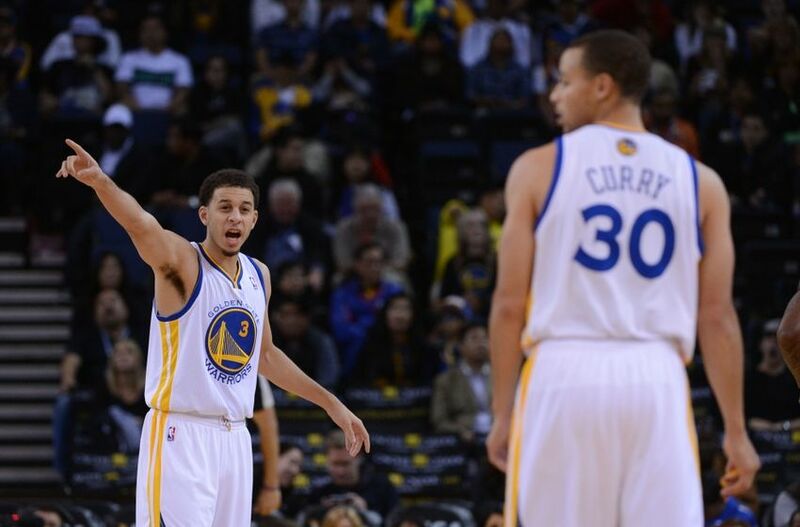 Steph admired the strength with which he attacked the basket, whether he was hacked or not. Those buckets imbued him with confidence that no AAU showcase could. When students at Charlotte Latin School chanted, You’re not Stephen! Seth answered with four straight threes. “It was his fuel,” says Charlotte Christian coach Shonn Brown. “His motivation.” Seth was never bitter but always driven. Steph wrote DAVIDSON with a glow-in-the-dark marker on Seth’s bedroom wall, hoping he’d follow in his college footsteps. But that was Steph’s campus. “I didn’t want to go to Davidson,” Seth says. “I wanted to do my own thing.” He chose Liberty, after a hamstring injury sidelined him in the summer before his senior season, costing him looks from bigger programs. Summer League had never been kind to Seth. In 2014 he averaged only 9.8 points in Orlando, with the Magic, and 10.2 in Las Vegas, with the Suns. This July he returned to Vegas, but he was with the Pelicans, and Darren Erman was the coach. Erman, who had worked with Seth at Golden State, told him, “We’re going to give you every opportunity to show what you can do.” It was Seth’s last chance, and his best one. Erman played him 30 minutes or more in every game, and Seth put up 24.3 points. Oddly, he shot just 22.2% from three, proving once and for all that he could do more than let fly from the wing. Erman challenged him during timeouts. Can you guard this guy? Can you score in that situation? “Without question,” Seth replied. It became a mantra.